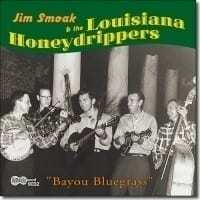 Bluegrass from banjo master Jim Smoak and the Louisiana Honeydrippers. Smoak began his career in 1952 with Carl and Pearl Butler. Within two months he was hired by Bill Monroe to play banjo in the Bluegrass Boys, with whom he is heard on the classic tunes "Close By," "My Little Georgia Rose," and "Put My Little Shoes Away." He also played with Little Jimmie Dickens, Bruce Broussard, Arthur "Guitar Boogie" Smith (he replaced Don Reno), and Hylo Brown. His songs have been covered by the Newgrass Revival, J.D. Crowe, and the Dixie Chicks. Smoak is still active today, playing regularly with the Mountain Dew Hillbillies. This title contains previously unreleased material, as well as the original material recorded by Dr. Harry Oster. While banjoist Jim Smoak isn't well-known in bluegrass circles, his credentials are excellent. Smoak played and recorded with Bill Monroe in the early '50s and, following a stint in the army, played with Hylo Brown. In 1960 Smoak returned to the south and put together the Louisiana Honeydrippers for a recording session with Harry Oster. One can immediately pick up the influence of Monroe and the more rustic strains of tradition on Bayou Bluegrass. Smoak's old-time vocals seem just right for folk tunes like "Liza Jane," "Old Dan Tucker," and "Mama Don't Allow," and the band's accompaniment, more reminiscent of 1946 than 1960, seems just right. The ingredient that separates these songs and instrumentals from other traditional albums, however, is the "Bayou" factor, which is provided alternately by fiddlers Dewey Edwards and Bucky Wood. Edwards' bow work on "Rabbit, Where's Your Mammy?" and "The Fisher's Hornpipe" gives these pieces a real Cajun flavor. Smoak reinforces this old-time Cajun feel by using claw-hammer and single-note style, respectively, on these pieces. Several songs, including "East Bound Train" and "Underneath the Weeping Willow," are smoothed out a bit by J.C and V.J. Meyers' fine harmony. Bayou Bluegrass is a vital disc, full of inspired performances and lots of deft picking. The 2002 reissue includes four previously unreleased bonus cuts.